Laura Ashley PC660LA is a machine made for professionals. Some might consider it expensive though. 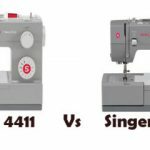 To be honest Laura Ashley PC660LA is not yet popular in U.S. Its lower end model the Laura Ashley CX155LA has started making in-roads in the sewing world with its quality and performance, but not this one. PC660LA is yet to make a name among sewers. This is a machine made for professionals, beginners have nothing to do with this. It is way too expensive for beginners to afford. There are 303 built-in stitches in total. The stitches include 128 sewing stitches, 10 one-step buttonholes and 3 sewing fonts. Each sewing font comes with 55 alphanumeric characters. Laura Ashley PC660LA is a computerized sewing and quilting machine. Almost all features are computer controlled. Beginning from the start/stop button to thread cutting. The backlit LCD display is where you can select and adjust the stitch settings. The display is not touch operative or large, it is of the same size as you get on lesser beginners sewing machines. The top drop-in bobbin with clear cover makes it easy to load the bobbin. The independent bobbin winder motor lets you sew even while you are winding the bobbin. Sewing light (2 LEDs) is provided for illuminating the work area. The automatic needle threader on Laura Ashley PC660LA is a real time saver. There is an automatic thread cutter as well. 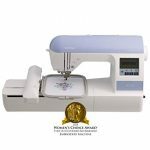 What makes PC660LA a very good quilting machine is the adjustable presser foot height and pressure. You can adjust the presser foot height to allow extra clearance for multiple layers of fabrics. The presser foot pressure can be adjusted for better fabric feeding. Free motion sewing can be done by sliding the feed dog lever. Needle up/down button is another feature that quilters love. Knee lifter is another huge bonus while pivoting. Laura Ashley PC660LA also has a unique custom stitch feature which lets you save up to 10 personalized stitch patterns on the machine memory. However it doesn’t support USB connectivity or memory card. You can combine stitches or mirror stitches for customization. 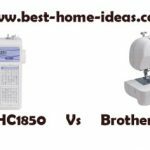 The thread tension is set automatically by the machine according to the type of fabric. An extra large table is provided for oversized quilts. The accessory package that comes with this machine is quite impressive. Accessory feet includes Buttonhole foot, Overcasting foot, Monogramming foot, Zipper foot, Zigzag foot, Blindstitch foot, Button fitting foot, Walking foot, Quilting foot, Stitch guide foot, Adjustable zipper/piping foot, Non-stick foot, Open toe foot and 1/4″ Quilting foot. In addition to this, you will also get a lot of other accessories. The accessory pack on itself is worth some money. Laura Ashley PC660LA is not a light weight machine by any stretch of imagination. It weighs 18.74 pounds. The machine comes with an included hard cover. It has 25 year limited warranty. The operation of the machine is quiet and smooth. The machine is easy to thread. 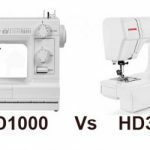 It is very much capable of sewing heavy duty fabrics like denim or hard leather (It must be, because we are spending a lot of money on this). The overall working of this machine is quite satisfactory. On Laura Ashley PC660LA, you can only make letters as large as 7mm, that is the maximum stitch width you can get. This might be small for some. There is no issue about the quality of Laura Ashley PC660LA. It will be a great tool for a professional sewer. To be honest, I normally test a machine for longer periods before reviewing. I didn’t get enough time with this machine as much as I would have liked. So I am not sure about how this would perform in the long run (hence the ‘moderate’ recommendation level). 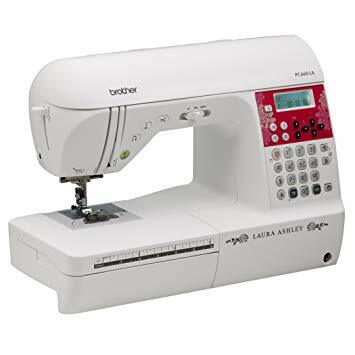 I personally own Laura Ashley CX155LA, which is an excellent machine. So I expect this one to be good as well. But some might consider this machine as expensive. 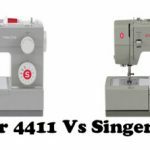 Another machine you can consider is the Singer 9985 Quantum Stylist. It costs few dollars less and has many more features than Laura Ashley PC660LA. 9985 has 960 built-in stitches, touch screen display and many more. It is a machine rated highly by its users (we also rate it pretty high). It is a popular model than PC660LA in this price category.